Posted on May 25, 2017 at 9:41 pm. Mail-in ballots for the special Transportation Development District formation election will be mailed to qualified voters on Tuesday, June 20. Approximately 6,000 ballots will be printed, based on early estimates from the Circuit Court. The Circuit Court is administering the special election, per the TDD statute. An image of the envelope qualified voters will receive is below. The Circuit Court received a completed ballot application by the May 23 deadline. Once voters receive their TDD formation ballots in June, they have until 5 p.m. on Tuesday, August 1 to return them. In accordance with Missouri law, all mail-in ballots must be notarized. Ballots are notarized free of charge by any Public Notary. Text of the ballot language is here and is for informational purposes only. Voters must use the official ballot they receive in the mail. 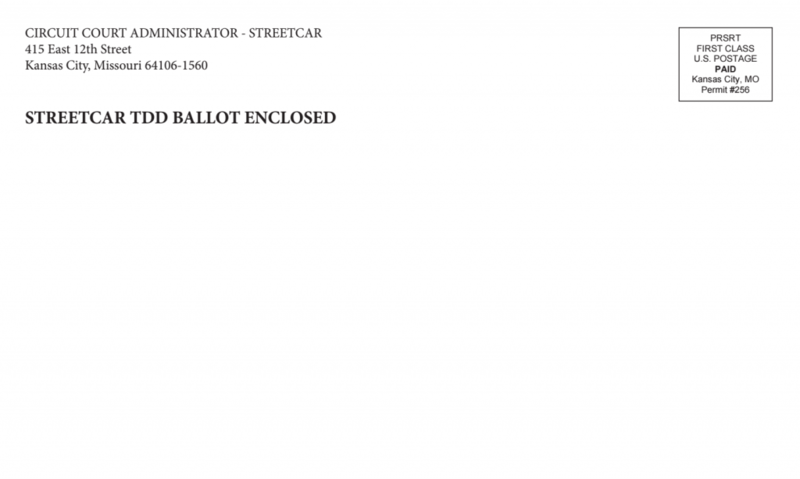 For more information, see the Circuit Court’s website (http://16thcircuit.org/streetcar) or http://kcrta.org/streetcar/.